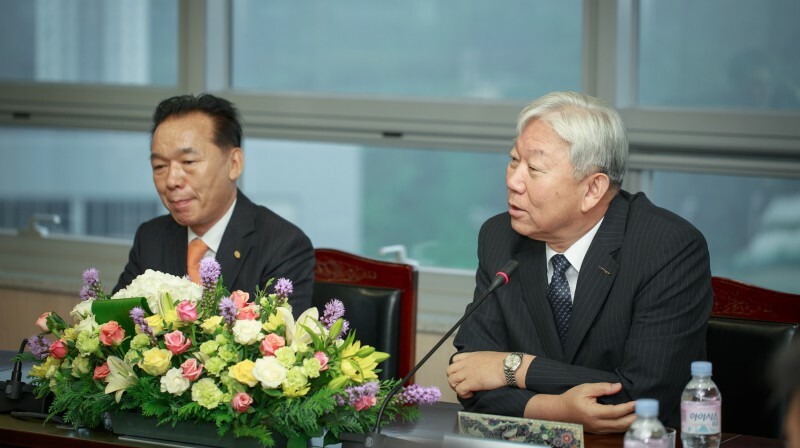 From left are JongHun Oh and President Young-chan Choi of Sunbo Angel Partners Co., Ltd., UNIST President Mooyoung Jung, and President Geum-sik Choi of Sunbo Unitech. Taking the lead in the activation of the venture industry in the southeastern region of S. Korea. 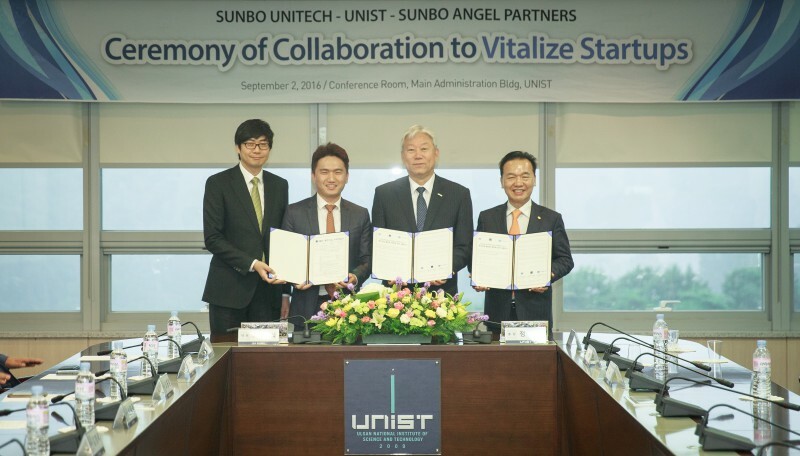 On September 2, 2016, UNIST signed a Memorandum of Understanding (MoU) with a shipbuilding equipment manufacturer, Sunbo Unitech Co., Ltd. and Sunbo Angel Partners to accelerate the efforts to invigorate technology venture startups in the southeastern region of South Korea. Through this partnership, UNIST has secured funding of KRW 500 million from Sunno Unitech Co., Ltd. to establish and operate a joint technology holding company within this year. UNIST will become the nation’s first university to establish a joint investment company, which specifically invests in promising startups. With this as a momentum, UNIST hopes to support the technology commercialization and the growth of new businesses. From left are President Young-chan Choi of Sunbo Angel Partners Co., Ltd., Vice President Sang-Sik Choi of Sunbo Unitech, resident Geum-sik Choi of Sunbo Unitech, and UNIST President Mooyoung Jung. With almost KRW 200 billion deployed to the establishment of this holding company, the technology development, investments, and the creation of venture startup ecosystem are beginning to gain momentum. In the MoU, the three organizations also promised to accelerate the effort to create the virtuous circle of the venture ecosystem. The intention is to promote academia-industry cooperation and to create new growth engine in regions, thereby contributing to the economic growth of South Korea. This company is run on business start-up support system, helping to provide business knowledge, manpower, infrastrucure, and services that are needed during the commercialization process of UNIST’s exceptional technologies. By bridging technologies with funding, the three organizations will establish a subsidiary and provide marketing management support system that become necessary as the company grows. President Mooyoung Jung of UNIST at the signing ceremony of the MoU for collaboration among UNIST and Sunbo Unitech, and Sunbo Angel Partners Co., Ltd. In support of technology transfer and commercialization, UNIST will provide one-stop supporting system for young venture startups. This includes establishing startup supporting place to be located at UNIST student dormitory, as well as financial support to discover and excavate future technologies. President Young-chan Choi of Sunbo Angel Partners Co., Ltd. states, “By bringing our excellent manufacturing infrastructure and UNIST’s exceptional technologies together, we will foster promising startups to grow and stay more globally competitive.